Up to six weeks after your operation, you will return to the implant centre for Switch On where an audiologist will fit the external speech processor and connect it to the computer used to adjust the settings on your device. When switched on, the speech processor sends signals to the electrodes in the cochlea for the first time. The audiologist will spend time ‘tuning’ it to help you start to ‘hear’. Rather like taking an audiogram, you will be asked to indicate when you become aware of sound while each individual electrode is adjusted. This is called setting the “T” or threshold levels. Next you will be asked to indicate a comfortable level of sound for each electrode. This is called setting the “C” levels. Finally, the speech processor’s microphone will be activated and the first thing you will hear is the audiologist asking you if you can hear! Conversation may sound quite different from what you remember. It is often described as mechanical or tinny. But these effects quickly disappear and speech becomes more natural-sounding as you adjust and gain more exposure to the sounds of conversation. You will notice lots of environmental sounds like footsteps, running water, dogs barking, birds singing, and the telephone and doorbell ringing. 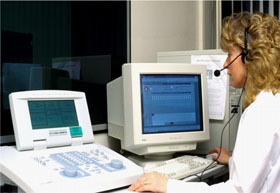 After your implant is ‘switched on’ you will need some weeks to get used to hearing with the implant and you will have several tuning sessions where the audiologist will make adjustments to the computer settings as your performance progresses. In parallel, you will receive hearing lessons from a Speech & Hearing Therapist who will help you identify different sounds and distinguish vowels and consonants during a series of lessons. You will be given conversation exercises to do at home with your family. The extent of this important training will depend on the nature of your hearing loss and the extent to which the implant is performing. You will be encouraged to listen to audio books. The training will be longer and more complicated in the case of born deaf and prelingually deaf children. Adults with a long duration of deafness prior to implantation may take longer to achieve the full benefits and will, generally, need more support from the rehabilitation team. Recently deafened adults generally adapt faster to the use of their implant.